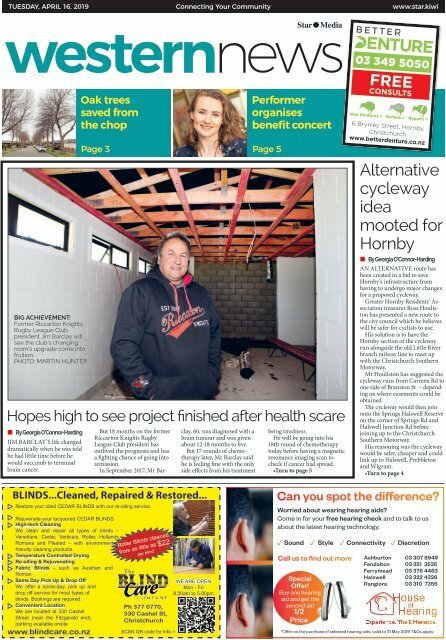 TUESDAY, APRIL 16, 2019 Connecting Your Community www.star.kiwi BIG ACHIEVEMENT: Former Riccarton Knights Rugby League Club president Jim Barclay will see the club’s changing room’s upgrade come into fruition. PHOTO: MARTIN HUNTER • By Georgia O’Connor-Harding JIM BARCLAY’S life changed dramatically when he was told he had little time before he would succumb to terminal brain cancer. Oak trees saved from the chop Page 3 Page 5 But 18 months on the former Riccarton Knights Rugby League Club president has outlived the prognosis and has a fighting chance of going into remission. In September 2017, Mr Barclay, 60, was diagnosed with a brain tumour and was given about 12-18 months to live. But 17 rounds of chemotherapy later, Mr Barclay said he is feeling fine with the only side effects from his treatment Performer organises benefit concert Hopes high to see project finished after health scare being tiredness. He will be going into his 18th round of chemotherapy today before having a magnetic resonance imaging scan to check if cancer had spread. •Turn to page 5 03 349 5050 free CONSULTS New Dentures > Relines > Repairs > 6 Brynley Street, Hornby, Christchurch www.betterdenture.co.nz Alternative cycleway idea mooted for Hornby • By Georgia O’Connor-Harding AN ALTERNATIVE route has been created in a bid to save Hornby’s infrastructure from having to undergo major changes for a proposed cycleway. Greater Hornby Residents’ Association treasurer Ross Houliston has presented a new route to the city council which he believes will be safer for cyclists to use. His solution is to have the Hornby section of the cycleway run alongside the old Little River branch railway line to meet up with the Christchurch Southern Motorway. Mr Houliston has suggested the cycleway runs from Carmen Rd to one side of Branston St – depending on where easements could be obtained. The cycleway would then join onto the Springs Halswell Reserve on the corner of Springs Rd and Halswell Junction Rd before joining up to the Christchurch Southern Motorway. His reasoning was the cycleway would be safer, cheaper and could link up to Halswell, Prebbleton and Wigram. •Turn to page 4 BLINDS...Cleaned, Repaired & Restored... Restore your oiled CEDAR BLINDS with our re-oiling service. Rejuvenate your lacquered CEDAR BLINDS High-tech Cleaning We clean and repair all types of blinds – Venetians, Cedar, Verticals, Roller, Hollands, Romans and Pleated – with environmentally friendly cleaning products. Temperature Controlled Drying Re-oiling & Rejuvenating Fabric Blinds - such as Austrian and Roman Same Day Pick Up & Drop Off We offer a same-day, pick up and drop off service for most types of blinds. Bookings are required. Convenient Location We are located at 330 Cashel Street (near the Fitzgerald end), parking available onsite Roller Blinds cleaned from as little as $22 per blind Ph 377 0770, 330 Cashel St, Christchurch www.blindcare.co.nz SCAN QR code for Info > WE ARE OPEN Mon - Fri 8.00am to 5.00pm Can you spot the difference? Worried about wearing hearing aids? Come in for your free hearing check and to talk to us about the latest hearing technology. p Sound p Style Offer! Buy one hearing aid and get the second aid p Connectivity p Discretion Call us to find out more Ashburton 03 307 8949 Fendalton 03 351 3535 Ferrymead 03 376 4483 Special 1/2 Price Halswell 03 322 4326 Rangiora 03 310 7355 *Offer on the purchase of selected hearing aids, valid to 31 May 2019 T&Cs apply.